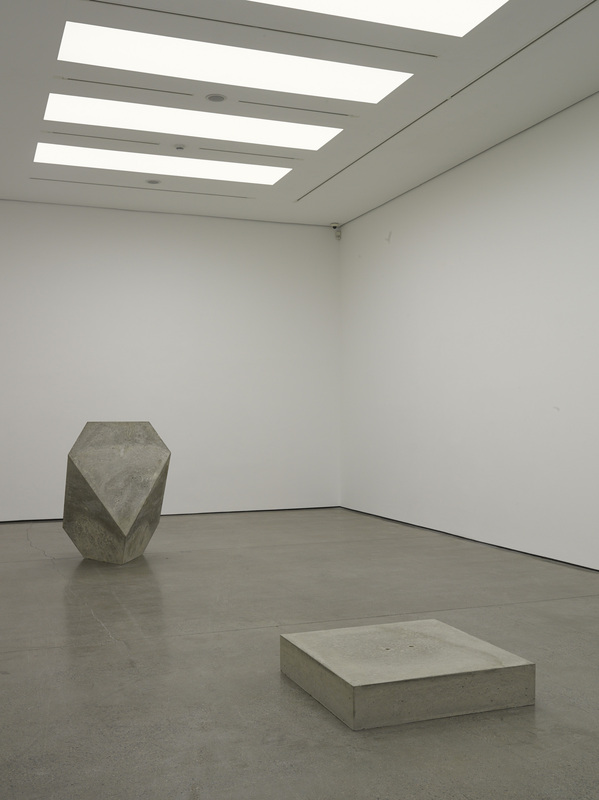 White Cube’s latest exhibition at their Masons’ Yard space is Miroslaw Balka’s DIE TRAUMDEUTUNG 25,31m AMSL. The title refers both to the building’s altitude above sea level and the original German title of Freud’s The Interpretation of Dreams – the exhibition running concurrently with another at London’s Freud Museum (73,32m AMSL). The title immediately suggests a connection with mental landscapes whilst – as with his vast steel box construction, How It Is, which occupied the Tate Modern turbine hall a couple of years ago – Balka’s work also is strongly connected with the body, materials and the physical. The ground floor gallery houses just two minimalist concrete sculptures. The first, entitled 100 x 100 x 20 TTT, is a flat structure from which an internal light shines. Is it a plinth, a grave or perhaps a trapdoor to a subterranean space? Alongside is a trapezohedron, open at one side, that is inspired by the mysterious object in Abrecht Durer’s Melancolia 1 (1514) and matches the magic ‘invisibility’ helmet from Wagner’s Das Rheingold. In the basement space Balka has installed Above your Head – a steel mesh canopy (chicken wire to you and me) fixed just above head height. He has added to this dim lighting and the whistled soundtrack of the Great Escape theme tune ‘to continue the theme of refuge and confinement’. This all relates to recurring Balka references that cover topics like Polish history and the holocaust. Unfortunately it doesn’t work. The White Cube space looks like – well – a big space with a chicken wire ceiling and doesn’t invoke the claustrophobia and sense of confinement that it is meant to. The whistled tune is annoying and obvious whilst the ‘escape hatch’ sculpture of the upper gallery is far too simplistic. The attempt at some sort of mystery supposedly introduced by the enigmatic tarpezohedron seems just a little desperate and the whole is far too literal. Perhaps the second exhibition at the Freud Museum makes more sense, but I won’t personally be finding out. You are currently reading Miroslaw Balka DIE TRAUMDEUTUNG 25,31m AMSL at White Cube at a kick up the arts.